The easiest way to lose fat naturally has nothing to do with diet or exercise. It is a lot simpler than that. It is so simple that it is silly. In fact, you do not even have to buy anything to do it. Here is the surprise. This photo says it all. Read on to see what I mean. When you want to know how to lose stomach fat, your best friend (or maybe your worst enemy) is an enzyme called lipoprotein lipase (LPL). Its role is to cleave fats from lipoproteins (i.e., proteins that have fat attached to them) known as LDL cholesterol and VLDL cholesterol. One form of LPL works in fat cells and is activated by insulin. Another form of LPL works in muscle cells and is not activated by insulin. What this means is that when you are well-fed (we all are) and sedentary, more fat will go into your fat cells than into your muscle cells. This explains why eating plenty of food and being inactive makes you fat. No surprise there. The key, then, is to activate LPL in muscle cells. The good news is that you can do this without exercise. Indeed, for most people, exercise will not be as effective as doing one simple thing: standing up more often. Yes, muscle building exercise will raise the levels of LPL and enable muscle cells to take in and burn more fat for energy. However, no amount of exercise will overcome the side effects from what most people do, that is, sitting down all day. Only standing up more often will overcome the side effects of sitting down too much. The important point to grasp here is that being inactive does not have the same effect as sitting down all day. Sitting down too long is much worse. Likewise, exercise does not have the same effect as standing up. Standing up specifically directs the activation of LPL in muscles that we use for supporting our posture when we are standing up. We do not use them while sitting down, and we do not exercise them when we work out. Some of the research behind this explanation is astounding. For example, when you sit, the activity of LPL drops more than 90 percent in the muscles that help us stand up. Within 2 hours this shows up as a 20 percent decrease in healthy HDL cholesterol. Lean people stand up, on average, for about 2 hours longer than their counterparts. The sitting crowd, on the other hand, has more obesity, more hypertension, higher blood triglycerides, lower blood HDL cholesterol, and higher blood pressure. Finally, older people who move around instead of sitting have half the death rate of their sitting peers. How else can you benefit from standing more often? Is it not enough to be leaner, have lower triglyceride levels, better blood HDL cholesterol levels, lower blood pressure, and a longer life? In the immortal words of every late night infomercial, Wait, there’s more! You will also eliminate the so-called ‘long-distance flight fat ankle’ syndrome. If you sit all day and your ankles swell up, you can retain so much fluid that you can gain 4-5 pounds in one day. Seriously. If you see a puzzling weight gain from one all day sit-down to the next, even if your ankles do not swell up, you are retaining too much fluid. The explanation for this is that you need enough fluid to keep blood flow going. When everything slows down due to too much sitting, any food you eat will just add to the sludge. Your blood flow becomes more like ketchup than freely flowing blood. Your body’s only defense is to hang onto water to keep things moving. After reading all the above, the good news and bad news is that you have to stand more. This is good news because it is easy to do, and theoretically you should not have to buy any special equipment to do so. (Maybe you will need a stand-up desk.) The bad news is that you really must do something out of your normal daily activities. And it may seem strenuous at first. Fortunately, humans are supposed to be upright. This means that the muscles that you have for standing up are already there for you. All you have to do to get them in order is stand up more. In fact, once you get them working the way they are supposed to, it won’t be so difficult to stand up more every day. Now go do it, and you will be pleasantly surprised how another daily activity (standing) gets better … i.e., the one where you stand on the bathroom scale. The number will start to go down. by Body Fat Composition And Ideal Body Fat Percent | Golf Distance - How I Achieved it. 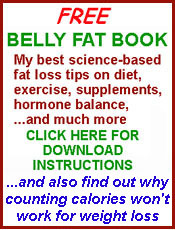 Your topic Silly Number One Fat Loss Secret | was interesting when I found it on Sunday searching for how to lose weight fast. Given that obesity in US is such a big issue, I think this topic is very important and relevant…. Sure. Just link back to it and you can post any or all of the article. Thanks for your interest! have been visiting your blog around 3 days. really enjoy what you posted. by the way i will be doing research regarding this subject. do you happen to know any other websites or maybe forums that I might get more information? thanks a lot. Thank you for your kind comments. Regarding your question about other sites or forums, yes, there are plenty. You could almost spend all of your time hunting for them and reading them. My suggestion is to simply search on whatever keywords you are interested in (e.g., belly fat book), and see what you come up with. Just one caution, that when you find something that is clearly there for hyping some special product, then you can expect all of the information to be slanted. Just have fun! Great blog! Do you have any hints for aspiring writers? I’m planning to start my own site soon but I’m a little lost on everything. Would you suggest starting with a free platform like WordPress or go for a paid option? There are so many choices out there that I’m completely overwhelmed .. Any ideas? Thanks! Thanks for the question. Yes, I have lots of hints and direction for aspiring writers. If you can write, you can be ahead of 99 percent of what other people do online. I definitely advise you to use as many free tools as possible. The cost to you will be your time. Keep this uppermost in mind: Good original content is king. Have you launched your blog yet?